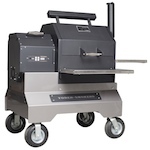 Bobeque wrote: I ordered a YS640 on November 9th and am waiting for delivery of the smoker. Will mine have the improved diffuser plate or do I need to order it? This is an optional accessory, and is not included with the cooker. You will need to order separately, or with the cooker when ordered. Hi Herb, Can this be ordered online? 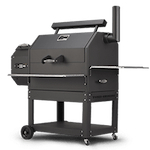 I have looked at the All Things BBQ site and cannot find the part listed. Thanks for the update! Theokoye wrote: Hi Herb, Can this be ordered online? 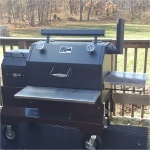 I have looked at the All Things BBQ site and cannot find the part listed. Thanks for the update! It will be on ATBBQ.com shortly. I like this, will probably order one! Only question is since it is physically weaker are there bars welded underneath to keep from flexing? Bond some teflon and super easy clean up.. I usually wrap my diffuser plate in foil to keep it clean. Can I wrap foil over this diffuser plate and not interfere with the grate cover. Also, my diffuser plate has warped over the last year and a half. If this plate warps will the grate cover still fit in place, or should I budget for a new diffuser plate every 2 years. I just ordered 2 of them. They should be shipped today. Call All Things BBQ to order. cnardo24 wrote: I usually wrap my diffuser plate in foil to keep it clean. Can I wrap foil over this diffuser plate and not interfere with the grate cover. Also, my diffuser plate has warped over the last year and a half. If this plate warps will the grate cover still fit in place, or should I budget for a new diffuser plate every 2 years. Yes you can still use foil on the diffuser. This new optional diffuser, used normally and as intended, will not warp. Ordered mine for my 640. 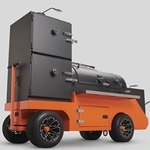 This will make it SO much easier to change back and forth from grilling to smoking! I would imagine that covering it with foil would be almost necessary considering if you do not grease will find its way inside the access panel. Theokoye - I agree. Wrapping in foil and frequent cleaning is a must. Thanks for the quick feedback Herb. I'll be ordering one! Yoder_Herb wrote: The new OPTIONAL 2 piece heat diffuser for YS480 and YS640 has been released and is ready for shipping! Yoder made, Yoder supported, Yoder quality, and will not affect your warranty. Allows easy clean out access to the burn grate/firebox, and does not require removal for temperatures above 400 degrees. Call 877.409.6337 and select option 1 for sales, or send an email to info@yodersmokers.com to order. Herb, is there any temp limit above 400 deg where the new diffuser must be removed? I would love to cook pizza at 600 with the diffuser in. Thanks Herb, next year it's on my list. Good upgrade. The standard diffuser that ships with the cooker has not been changed or modified. I have forwarded your suggestion to the sales team. Thanks for being a part of the Yoder Smokers family! Just got my new plate with the access door. Should I cover in foil to keep drippings from seeping through the door or not? Using foil is a personal choice. I do not use foil. I'm a Newbie and so far haven't used foil, but I clean the diffuser plate with a pressure washer. Thanks for the replies, I was curious if the door would let to many juices through to the fire............. Going to season with canola oil tomorrow and roll with no foil. Those that have and have used the new diffuser with the door, do you recommend it? Grandpax4 wrote: Those that have and have used the new diffuser with the door, do you recommend it? Mine has worked well on the few short cooks I have used it with. My door does have a bit of play, but it does not seem to be causing issues. I have been using a prototype since January of 2013, and have not had a single issue. Follow the instructions, and you will not have issues. So now I am curious. I have not seen pics or at least I don't think I have seen the new upgraded heat diffuser. Is it the one with the door to access the heat pot or is that just what the 2 piece diffuser is? I saw the video on your Facebook page with the access door and it has the reinforcement so I wasn't sure if that was the new one or if he was meaning it was the new 2 piece version. I'm not gonna lie, I'm excited about the access door and not having to tear so much apart to clean out the pot. If the new version doesn't have the door I will probably just get the 2 piece version and pass on the upgraded version. Thanks in advance. No, the new reinforced diffuser is not the optional 2 piece diffuser. The 2 piece is an optional accessory, and must be purchased separately.